A fresh, spicy tea with notes of citrus fruit and pink pepper. This tea is best when it is drunk pure. 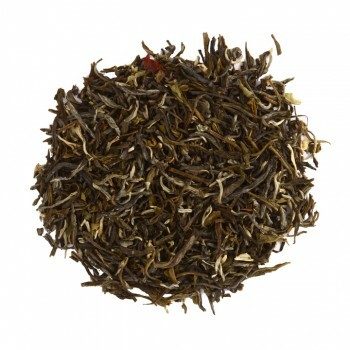 The Darjeeling Snowview is a black tea from India. The tea is grown on a plantation in Darjeeling in Northwest India in the Himalayas. This village is surrounded by 20,000 hectares of tea plantations. The plantation is located at an altitude of 2200 meters. The tea plant is descended from the Camellia Sinensis which is better resistant for the climate in the high mountains. Darjeeling tea is considered the best, most prestigious, rarest black tea in the world. The leaves are picked by hand. About 2000 leaves are needed for one hundred grams of tea. A black tea is a fully fermented tea. The Darjeeling can be harvested twice, a first picking "First Flush" and a second picking "Second Flush". This tea is from the second harvest. After the harvest, the leaves are laid to dry and rolled by hand. This is how the oxidation process begins. After a few hours of fermentation, the leaves will get baked in a hot air oven.